Taken at Gettysburg Nat'l. Military Park Better known as the Napoleon, the 1857 12 Pdr Field Howitzer was one of the mainstays of both armies during the war. 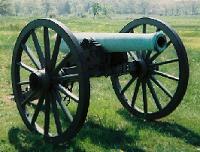 The Napoleon's massive smoothbore bronze barrel weighed approximately 1,200 pounds, making it one of the heaviest field pieces of the war. It was nonetheless very popular for its striking power, especially at closer ranges. The Napoleon was manufactured by the Ames Company and the Revere Copper Company in the North, as well as by various Southern Foundries.